Taking the time to listen to other’s experiences, cultures, and outlooks can transform us in the most beautiful ways. Lover of journalism, photography, and musicals. At 165 feet tall, the massive, ornately designed bell tower looms over students as they enter Topeka High School each morning. Topeka High is an inner-city school located just blocks away from the Kansas State Capitol building. Students rarely fit stereotypes at Topeka High, as Topeka High is not a typical secondary education institution. There is something to be gained at Topeka High not many other schools provide. It is not the courses offered, the graduation rate, the number of college-bound students, or even the architectural uniqueness of the building. What makes the Topeka High experience special for many students is the diversity of the student body. At Topeka High, students come from all walks of life. According to the Kansas Department of Education (KSDE), nearly 1,900 students attend Topeka High School. In the same report from 2017, KSDE reported 60 percent of Topeka High students as racial minorities and 65 percent of students as economically disadvantaged. In one class period at Topeka High, it is possible for a student whose family is struggling daily to make ends meet to sit on one side of you, while a member of one of the wealthiest families in Topeka sits on the other. As racial and economic divides continue to mount in the country, students at Topeka High reflect on the importance of going to a school with a diverse student body. Kainalu Rader, senior, similarly stated the greatest advantage of attending Topeka High is working with people from different backgrounds. Kirsten Cigler has been teaching English at Topeka High for 23 years. Cigler says understanding others is part of Topeka High’s tradition. If someone has never stepped foot inside of Topeka High, they would never be able to truly understand the atmosphere. At Topeka High, students take the time to understand each other. They take the time to have real conversations with their peers who might be completely different from them. While this may sound all too perfect to an outsider, it is true. There are Topeka High students who face real-world struggles — homelessness, poverty, and economic disadvantage. Some kids are relied upon to take care of younger siblings. Some kids are in gangs. Some kids are in the foster care system. On the flip side, there are students who are scoring high on standardized tests, doing work from within the Topeka community, and are getting into some of the best universities in the country — none of those things being mutually exclusive. Going to Topeka High means learning from and about others. It means taking the time to consider other people’s circumstances and experiences. As an example, Cigler described a situation in which a student might smell bad to others. At Topeka High, students are surrounded by people who do not look like them, who do not share the same beliefs as them, and who have different interests. There is an ethereal beauty about the mixture of people at Topeka High. While every student who attends Topeka High is uniquely different, we all understand we share our learning spaces and we respect each other because we are different. At the end of the day, we all understand there are parts of us we share and parts of others which are shared with us. Not only do Topeka High students have the opportunity to engage with students of different backgrounds and walks of life, but students have the opportunity to become politically engaged, as Topeka High is located only a few blocks away from Kansas’ State Capitol building. Topeka High students gather on the Kansas State Capitol steps during the walkout against gun violence on March 14. After the shooting at Marjory Stoneman Douglas High School in Parkland, Florida, approximately 1,000 Topeka High students took part in the national walkout on March 14. 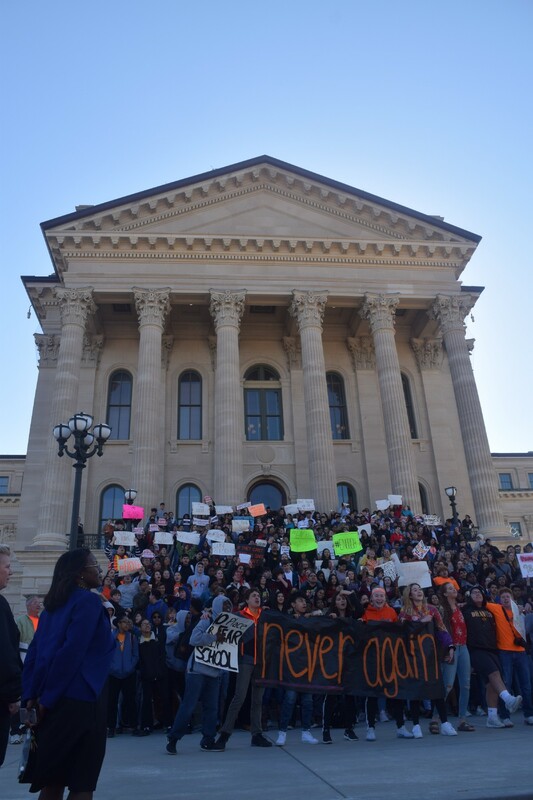 Due to the school’s close proximity to the Kansas Capitol building, Topeka High students once again marched to the Capitol building, this time in protest of gun violence and in support of the Parkland victims, survivors, and their families. Topeka High students are diverse, understanding, and politically engaged. Taking the time to listen to other’s experiences, cultures, and outlooks can transform us in the most beautiful ways.